“Estonian National Symphony Orchestra brought a diverse program to concertgoers on Friday night; two Russian giants of modernism and a German romantic turned Finnish innovator. But the real gem was the bravura interpretation of the night’s featured soloist. Passing from the comfortable euphoniousness of Pacius, the complex emotive world of Shostakovich appeared. Anna-Liisa Bezrodny’s interpretation of Shostakovich’s Violin Concerto No 1 gave form to the evening. Bezrodny’s is an impressive stage presence; confident and concentrated. Her focus over this quite long and varied violin concerto was nothing short of amazing. From the languid first movement to the concerto’s energetic conclusion, Bezrodny occupied her own musical space, and took concertgoers along for the ride. 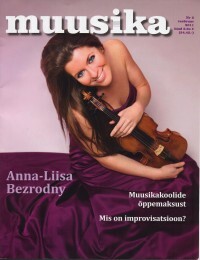 Cover story about Anna-Liisa featured in “Muusika” magazine in Estonia. 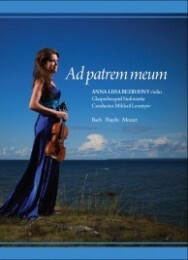 Cd release of Tamberg Violin Concerto, second recording ever to be made of this piece.